Keeping Current Matters is a nice Resource for first time or experienced buyers. 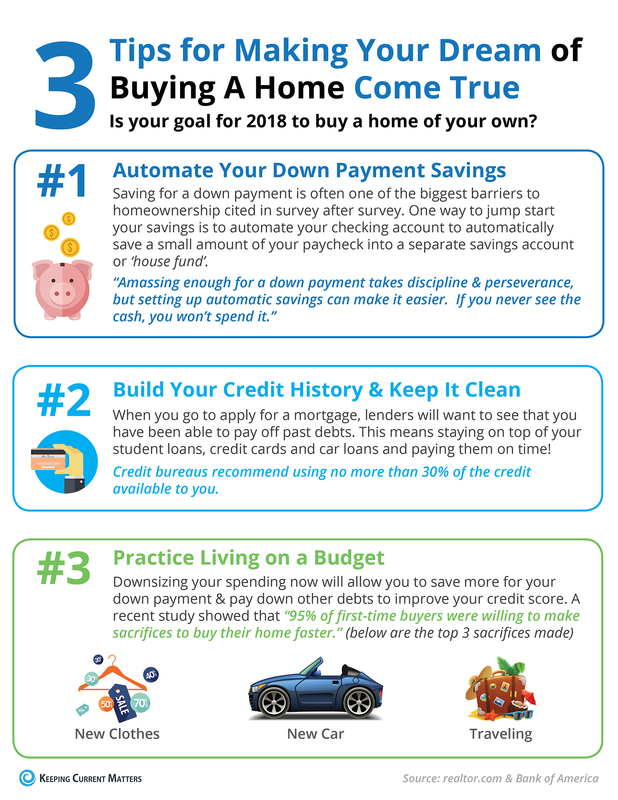 The tip for saving a down payment amount is a great tip. Have a separate account set up where money goes each paycheck. The trick is not to handle the money but allow the money to slide directly into that account and grow. You will be amazed how much will be accumulated without pain when you take on this strategic plan to save for a down payment. You should also begin to think and prioritize where your money goes if you don't already do that intentionally. The zero based budgeting system that is taught by Dave Ramsey makes sense. He intentionally wants you to assign a name to every single dollar you work so hard for - that way you are controlling your future! Kristine Stultz is an Award Winning Residential Real Estate Agent with an office in Anacortes Washington. She works with clients to Search Anacortes Homes, La Conner Homes, Samish Island Homes, Guemes Island Homes, Oak Harbor Homes and all homes for sale on Whidbey Island. Top producing, fun, full time, and great service. Always FREE home evaluations of your home or vacant land.